Upgraded graphics for VR gaming. With both Nvidia and AMD hitting various price points for Pascal and Polaris, respectively, it doesn't make sense to buy a gaming machine with a previous generation graphics adapter, not unless there's some other benefit (like a compelling cost savings). 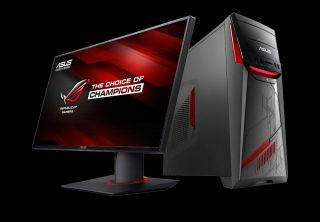 Nor do you have have to, not if you've been eyeballing a G11 desktop from Asus. The G11 line is now available with Nvidia's latest Pascal-based graphics card options. If you're ready to buy right now, pricing starts at $1,200 for a G11 with a GeForce GTX 1070 with 8GB of GDDR5 memory (G11CD-WB51-GTX1070), plus a few bucks for shipping ($3.99). Also included in that configuration is an Intel Core i5-6400 processor, 8GB of DDR-2133 RAM, 1TB hard drive (7,200 RPM), DVD drive, and 500W power supply. Connectivity consists of built-in 802.11ac Wi-Fi, Bluetooth 4.0, four USB 3.0 and USB 3.1 ports (two each on the front panel and rear), two rear USB 2.0 ports, dedicated headphone and microphone ports, and audio ports. The package comes with a USB keyboard and mouse. If you're looking to step up to a GeForce GTX 1080, the G11CD-DB72-GTX1080 will oblige for $1,800 (plus $5 shipping). That also gets you an upgrade to an Intel Core i7-6700 processor, 16GB of DDR4-2133RAM, and a 512GB SSD in place of the 1TB HDD. For gamers on a tighter budget, a version of the G11 with a GeForce GTX 1060 (G11CD-EH51-GTX1060) is available to pre-order for $1,000 (plus $11 shipping) and releases on November 2. That configuration drops things back down to 8GB of RAM and a 1TB HDD, and downgrades the CPU to an Intel Core i5-6400. All three G11 setups use the same funky looking case (Asus says it's a futuristic outer space design with Mayan-inspired elements). It's a mid-tower case with customizable LEDs spread across four areas, including a centerpiece that can display up to 8 million colors.